Now that a second Ebola case has been identified in the United States, federal health officials are looking for answers. The affected Ebola patient, a female nurse at Texas Health Presbyterian Hospital in Dallas, provided care for Thomas Eric Duncan, who died from the highly contagious disease on Oct. 8. According to the state's health department, the nurse wore the proper protective gear when she came in contact with Duncan. But officials at the Centers for Disease Control and Prevention say there's been a breach in Ebola protocol at the Dallas hospital — and they're not too happy about it. In a news conference on Sunday, CDC Director Dr. Tom Frieden said there's been an obvious breach of protocol, but the female health care worker couldn't identify when or how it occurred. Frieden added that the nurse, who has been placed in isolation since reporting a low-grade fever on Friday, has been interviewed by CDC officials. "It is deeply concerning that this infection occurred," Frieden said. He added that confirmatory testing is currently underway at CDC headquarters in Atlanta. We don't know what occurred in the case of the original patient [Thomas Eric Duncan] in Dallas, but at some point there was a breach in protocol, and that breach in protocol resulted in this infection. The healthcare worker developed symptoms on Friday. ... They were assessed Friday and tested yesterday. ... The level of her symptoms and indications from the test itself suggest that the level of the virus that she had was low. 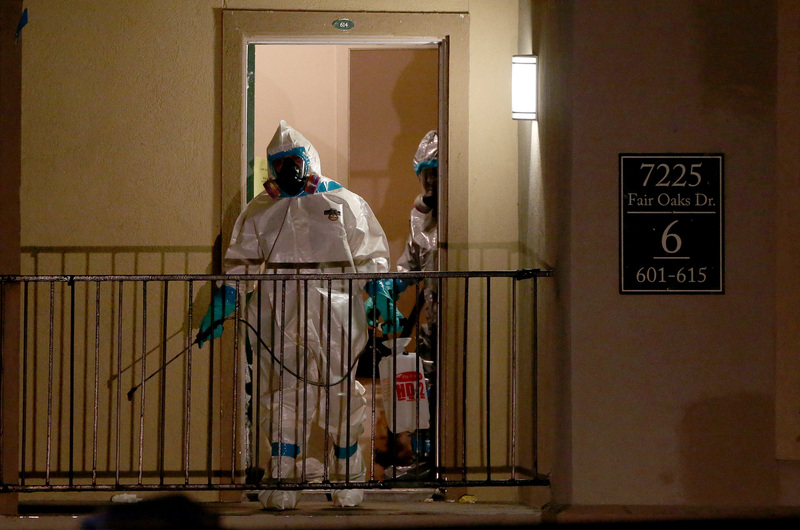 Frieden outlined the steps CDC officials are now taking to wrangle this new U.S. Ebola outbreak. "[We are] assessing her possible contacts from the moment she developed symptoms," Frieden said. He added that there's only one person, at this time, who had contact with the female patient when she was contagious. That individual is now under "active monitoring," the CDC director said. However, other health care workers who may have been at risk for exposure of the virus are going to be evaluated. "If this individual was exposed ... it is possible that other individuals were exposed," Frieden said. According to the CDC director, the female nurse had "extensive contact" with Duncan on multiple occasions. Duncan, who was the first person to develop and be diagnosed with Ebola in the U.S., initially arrived at the Dallas area hospital the night of Sept. 25. He was sent home by emergency room staff, only to return to the hospital via ambulance on Sept. 28. Although the hospital said in a statement that Duncan only had a low-grade fever at the time of his first visit, medical records released to The Associated Press by his family reveal that his fever was 103 degrees. The 42-year-old Liberian national died on Oct. 8, just a few days after he received an experimental Ebola drug. Duncan's nephew, Josephus Weeks, told NBC News last week that he called the CDC while his uncle was hospitalized because he "feared other people might also get infected if [Duncan] wasn't taken care of."